Viceroy is a board game for 1-4 players aged 12 and up. As they struggle for control over the fantasy world of Laar, players recruit a variety of allies, from a wanderer to a prince, and enact various laws. As the game progresses, each player builds their own pyramid of power by developing their state's military and magical might, increasing their own authority, and gaining the precious gemstones they need to continue expanding their nation. The player who has the most power points at the end of the game becomes the ruler of all Laar - and the winner! I was lucky enough to be a backer of this game, and I love it. Setup is relatively easy – the rulebook does a great job of walking through the steps required, and hopefully will become intuitive after a few more plays. Tech trees – As well as gorgeous looking, when you build your “Pyramid of Power”, you are rewarded accordingly. It does cost more the higher you go, but the rewards are worth it – the higher you go, the better they get. Rewards vary from character to character, and it never feels like an automatic decision. Many paths to victory – The scoresheet reminds me a lot of 7 wonders, as there are multiple ways to accumulate victory points, each one is interesting, and there’s even a conflict element, where you have to watch what your neighbours are doing, and react accordingly. Conclusion – If you’re intrigued by any of these items, I highly recommend giving this game a try, it’s well worth it. 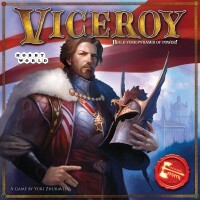 Viceroy once was a hit game, designed by and published in Russia, the game then had international distribution by Mayday Games, which many people got their hands on this hype game. Actually based on visual presentation, the game looks very interesting. Placing cards on tableau to form pyramid shape is kinda interesting. In Viceroy, players will bid cards with colorful gems (tokens) and play cards in their tableau. The cards played will grant effect in many different ways, while forming a pyramid from bottom to top. The mechanics are interesting, fresh and unfamiliar. The cards have different type and also have different colors on it’s corners, when combined these partial circle will form a full circle and give gem bonuses if the circle consists of one color. A nice and simple pattern building which added a bit of depth to the tableau building with the cards’ effect. You can always place cards above the other cards as long as the card has a foundation (2 cards below) and must follow the pyramid rule (must form a pyramid shape). I personally like these mechanics and very enjoyable, what I don’t like though, is the bidding mechanic. It’s quirky and really steal the fun. 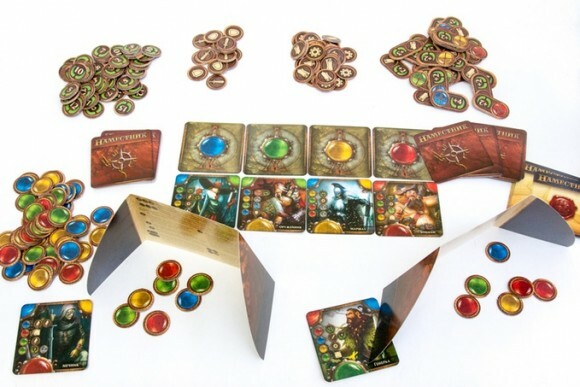 Players try to bid cards with gems, which only have 4 colors, the twist is that players must bid a color that’s different from others to get a card they want. If more than one players with the same color, they fail the bid and must bid again if they want (they still lose the gem though, costly). And I must say that losing one chance to get a card is so * crippling. Means you lose one chance to complete your cards and pyramid. It’s catastrophic, the biggest downfall of the game from my point of view. But you can still enjoy it though if you can accept this. The cards combinations offer a good deal of replay value since not all cards are revealed and players will get different cards combinations in each play. Concepts as simple as pattern building and colour-matching appear in games frequently. Viceroy, a strategic game of creating a conceptual “pyramid of power” in a fantasy world aces these in a very satisfying way. In the process, however, it kind of forgets what games are meant to be and the end result limps, rather than soars over the finish line. How come? Put on your best puffy shirt and let’s find out! The players play the role of powerful nobles competing for influence in a very loosely-defined fantasy world. They do so by recruiting different characters from an eclectic mix and adding these to their “pyramids of power” – patterns assigning relative importance their hirelings get in the ambitious organization that you are building. Kind of like a fantasy org chart (how exciting is that? Org chart!). You need to pay for these by gems, the game’s currency, that come in four different colours. The higher on your pyramid you want to place a hireling the more it costs. Each character card provides a reward based on which level you build it on. The rewards are things like magic, technology or straight victory points. At the end of the game these contribute to the final score in different ways (e.g. magic is hard to get going but can score you a million points, military can subtract points from opponents etc.). This is the game’s foundation (pardon the pun) and also its dullest, most math-heavy part. Two unique systems add to it in unique ways. First – in order to get new characters you need to bid on these from an available pool of recruits. You use the same gems as for purchasing to identify which character you’re going after. The trick is if both players bid on the same character – they have to discard their bids and bid again. Threats and negotiations are common here as nobody wants to let an opponent have a character they really need, but wasting a gem to interrupt someone’s bid is not ideal either. The square cards that comprise your pyramids also have coloured markers on their top corners and the bottom middle. If, putting together the two cards on the lower level and one on top, you manage to make a full circle – that scores you a gem right away and some additional points at the end of the game. Before we answer that question – let’s focus on what it DOES NOT feel like. And that’s building a fantasy empire. The majority of the game comes down to a simple calculation of maximum benefit based on what you can afford. The characters’ titles and images have almost no bearing on their effect and the wildly varying art styles fail to establish a consistent theme, ranging from steampunk to sword and sandals fantasy. The quality of it is also all over the place – some pieces are of fantastic quality – evocative and gritty, while others seem to belong on a cheap romance novel cover. The women characters in particular are mostly of the scantily clad variety. The gems, extremely simple as they are, look very appealing, almost three-dimensional and the colours are rich and vibrant. It is strange to admit this but such a simple element of the game’s look ends up its defining feature. Completing a circle by placing a matching colour on top of a carefully prepared foundation feels rewarding. The game falls squarely into the “multiplayer solitaire” category where for the majority of its duration you are looking only at your own pyramid, only occasionally glancing at your opponents’ to check if there are any obvious things they are collecting that you should be blocking. The interaction does not truly develop though and the dynamic of playing with others is mostly reserved to the very end when you tally the scores. The bidding teases exceptional dramatic potential as the reveal of the bids always feels like something special is about to happen, yet it is almost always is anti-climactic as opponents just end up going with their picks. Viceroy plays 2-4 and the interaction does increase in 3-4 player games but the duration grows significantly as well. The math-heavy nature of the bulk of the game makes it vulnerable to analysis paralysis that drags already static-feeling gameplay to a crawl. Two-player games, by contrast are done in a compact 40-50 min time. Viceroy, therefore, is best to be taken and appreciated for what it is – a static, low-interaction math puzzle with uneven, yet mostly appealing art and interesting mechanics that produce some satisfying spatial thinking (that ends up being more satisfying than the point calculations that comprise the bulk of the decision-making). It will disappoint those looking for a fantasy experience, despite featuring select knockout art pieces, as the theme feels largely pasted on. However, if you enjoy the math and spatial thinking, have a fair amount of table space and are looking for a low-interaction, low-competition activity with some notably satisfying moments – Viceroy will be a solid game to bring to the table once in a while. I know I like the gems enough to keep it in my collection. If you enjoyed this review consider visiting Altema Games website for more neat board game materials. Add a Review for "Viceroy"